AAM (American Axle & Manufacturing), Blue Cross Blue Shield of Michigan, Chemical Bank, Fifth Third Bank, Flagstar Bank, Huntington Bank, and Penske Corp. each contributed $5 million to fund physical improvements in Strategic Neighborhood Fund areas and affordable housing citywide. Every investment will be guided by resident input. Affordable housing development to fight displacement where there is growth. 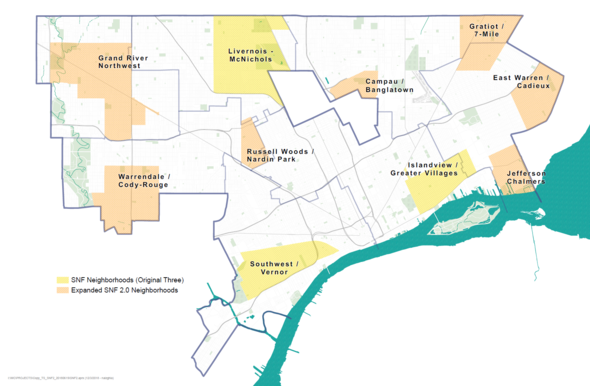 The Strategic Neighborhood Fund was piloted with a $42-million investment in the first three Strategic Neighborhood Fund areas: Livernois/McNichols, Southwest/West Vernor, and Islandview/Greater Villages. Improvements already underway include the new 2.5-acre Ella Fitzgerald Park in the Fitzgerald neighborhood of the Livernois/McNichols area; the Coe development in Islandview/Greater Villages, where 12 new units of housing were built on a vacant lot, including 30 percent affordable housing; and new lighting and planned improvements to Clark Park in southwest Detroit. The commitment will allow the Strategic Neighborhood Fund to expand this work from three to 10 areas and implement the new Affordable Housing Leverage Fund to fight displacement as the neighborhoods grow. The next seven Strategic Neighborhood Fund areas are Grand River Northwest, Jefferson Chalmers, Russell Woods/Nardin Park, Campau/Banglatown, Warrendale/Cody-Rouge, Gratiot/7-Mile, and East Warren/Cadieux. These new areas will see improvements in the next five years. Each of the areas are made up of clusters of neighborhoods, and the effort will ultimately bring development to more than 70 neighborhoods across the city. Affordable housing investments will be made citywide. The coalition of partners came together over the last year, an effort led by Duggan; Gary Torgow, chairman of Chemical Financial Corp.; Steve Steinour, CEO of Huntington Bank; and Dan Loepp, CEO of Blue Cross Blue Shield of Michigan. The seven corporate partners join a growing list of philanthropic organizations that have committed to inclusive neighborhood development. Following an initial $15-million contribution from the Kresge Foundation, additional foundations and organizations have made significant contributions to the expansion of the Strategic Neighborhood Fund. The planning process has engaged thousands of residents in hundreds of meetings across the city. In the Islandview Greater Villages area, city planners met with more than 1,500 residents during more than 25 public meetings. Residents who want more information on how to get involved in planning can click here or contact their district manager. The city’s $250-million Affordable Housing Leverage Fund will invest in preserving 10,000 affordable units and create 2,000 more. The city wants to ensure residents can find quality, affordable housing for people of all incomes and backgrounds wherever there are neighborhood redevelopment projects.